Walking in my garden after the rain looking for something new. Something caught my eye. Hiding under the leaves. 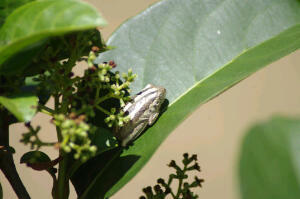 I saw this Tree Frog one would not noticed it . Its quiet and not moving at all as if sleeping just now and then the eyes would open and close again . Reblogged this on DISCOVERED AND UNDERSCOVERED INSECTS IN WITRIVIER SOUTH-AFRICA.